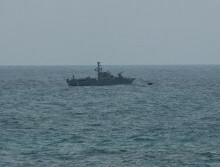 With rhetoric between the United States and Iran soaring, the Iranians are making threatening to blocking key shipping lines—and Israel is now on record as threatening to militarily fight back if Iran carries through. “If Iran tries to block the Bab-el-Mandeb, I am convinced that it will find itself facing a determined international coalition to prevent this. This coalition would also include the State of Israel and all its arms,” Israeli Prime Minister Benjamin Netanyahu said on Wednesday in comments released by his office, referring to the waterway known as the Bab-el-Mandeb Strait, a key artery for international oil shipping. The Iranians have focused their threats on the closer and more significant Strait of Hormuz that links the Persian Gulf with the rest of the world. However, CNBC reported that Iranian-backed Houthi rebels in Yemen have already attacked Saudi oil tankers in the Bab-el-Mandeb, through which 5 million barrels of oil are shipped per day. While that’s less than a third of what goes through Hormuz, the Bab-el-Mandeb strait is also more critical for Israel, as it links the Red Sea coast in Israel’s south to the Indian Ocean and is therefore the naval gateway for Asian trade with the Jewish State. Netanyahu specifically mentioned that Houthi attack in his comments, which were delivered to an Israeli naval officers’ graduation ceremony. Meanwhile, the US believes that Iran is about to launch significant naval wargames in the Strait of Hormuz. According to a report from Fox News, the US expects the drill to involve 100 gun boats and get underway this week. While the Americans told Fox News that American forces have not been threatened, they nonetheless are monitoring the exercise. That seems like a wise move, given that Iranian threats against the Strait of Hormuz continued on Tuesday. The Fars News Agency quoted Iranian Navy Commander Rear Admiral Hossein Khanzadi as implying that pending US sanctions on Iranian oil could be met with Iran’s ability to shut down oil shipping in Hormuz. “Certainly, the cruel sanctions against Iran will leave impact on the performance of the Strait of Hormuz and we should know that the decisions made in the international environment will not affect just one country as the moves made by others are also effective,” said Khanzadi. While Israel and Iran have largely engaged in a shadow war in Syria, multiple public confrontations in recent months have occurred between the sides, adding weight to Netanyahu’s threat to fight Iran directly at sea if necessary.